At Anritsu Corporation, we first started carrying out research on taste sensors in cooperation with Prof. Toko of Kyushu University in 1989, and we succeeded in developing the world’s first taste sensing system in 1993. In 2002, we established a new company, Intelligent Sensor Technology, Inc (INSENT) as a spin-off from Anritsu Corporation. Through our products, we provide innovative solutions to solve the problems of our customers. It was previously thought that taste was subjective and therefore could not be measured and evaluated objectively. However, with our unparalleled technology, objective taste evaluation is now possible. Through our taste sensor business, we will continue contributing to food culture by providing “the measure of taste” to international standards for people worldwide. President, Intelligent Sensor Technology, Inc. The taste sensors evaluate two types of taste, namely initial taste, which is the taste perceived when food first enters the mouth, and aftertaste, which is the persistent taste that remains in the mouth after the food has been swallowed. Using the potential of a reference solution* as zero, the difference in potential with the sample liquid is measured as the initial taste. The sensors are then lightly washed and the difference in potential with the reference solution is measured as the aftertaste. The Taste Sensing System TS-5000Z, which employs the same mechanism as that of the human tongue, converts the taste of various substances such as food and drugs into numerical data. Using unique aftertaste measurement technology, even aspects such as “richness” and “sharpness,” which could not be measured by conventional chemical instruments, can be expressed. Moreover, the proprietary analysis application makes obtaining analysis results easy. 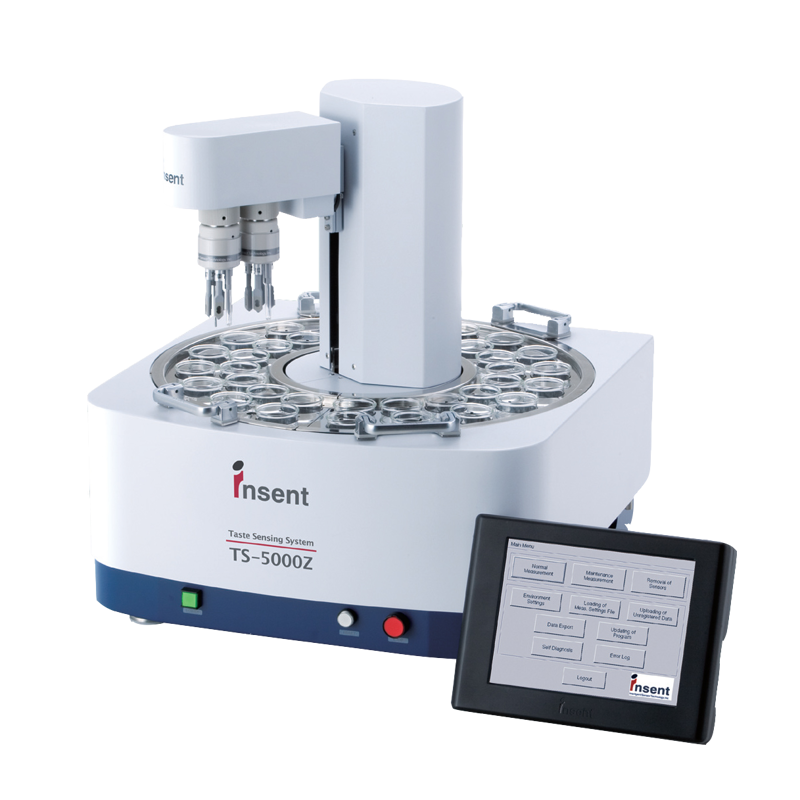 As a support tool for sensory evaluation, the TS-5000Z is a powerful tool for use in a variety of fields such as quality control, product development, marketing, and sales, where objective evaluation of taste is required. Sensors are devices that receive stimuli commonly detected by the five senses of sight, hearing, touch, smell and taste. They can be categorized into two types: physical sensors and chemical sensors. A physical sensor is a device that detects physical quantities, including light, pressure and sound. They have been in use for many years because they are based on relatively simple principles. In contrast, a chemical sensor is a device that detects chemical substances and represents a certain quality. For example, a pH meter is a chemical sensor that responds only to protons, and therefore it high selectivity. However, because there are thousands of taste substances, high selectivity to a single tastant is inappropriate for a taste sensor. A taste sensor is required to exhibit global selectivity so that it responds consistently to the same taste similarly to the human tongue. After years of research with Prof. Toko's group at Kyushu University, Japan, we have successfully developed taste sensors based on an artificial lipid membrane that consistently responds to similar taste. Figure 1 shows the response principle of taste sensors. The lipid in the taste sensor interacts with various taste materials via electrostatic and hydrophobic interactions, which causes a change in potential of the lipid membrane. The change is detected by a computer to provide a sensor output. Process 1: First, the taste sensor is immersed in a reference solution of 30 mM KCl and 0.3 mM tartaric acid to obtain the membrane potential, Vr. The reference solution has almost no taste and is used in this system as an alternative to human saliva. Process 2: Second, the taste sensor is immersed in the sample solution to obtain the potential, Vs. The difference in potential (Vs – Vr), called the relative value, should approximate the initial taste upon sensory evaluation, including its sourness and saltiness. Process 3: Third, the taste sensor is rinsed lightly with the reference solution. Process 4: After rinsing, it is immersed in the reference solution again to obtain the potential, Vr’. The difference in potential (Vr’ – Vr), called the CPA (change of membrane potential caused by adsorption), provides data on the adsorption of bitter and astringent substances. Process 5: Finally, the taste sensor is rinsed well in alcohol solution to remove adsorbed substances from the membrane before the next sample is measured. Technologically advanced taste sensors equipped with the TS-5000Z taste sensing system exhibit the specialized feature of global selectivity, providing meaningful results with high correlation to sensory scores. This system also enables the comprehensive and objective taste evaluation of foods, beverages and pharmaceuticals with high accuracy and reliability, and can be used in a wide range of fields, including R&D, marketing, quality control and quality assurance. The TS-5000Z was developed in 2006 under the financial support program, Risk-taking Funds for Technology Development, of Japan Science and Technology Agency (JST). For more details, see the online brochure for the TS-5000Z ( PDF: 3.79MB). Each taste sensor developed by our specific and innovative technologies has global selectivity to a taste quality, so sensor outputs can be converted to taste information that helps distinguish differences in both taste quality and intensity between samples. Table 1 shows the list of taste sensors and the related taste information. January 30, 2002 Intelligent Sensor Technology, Inc., also referred to as "INSENT", is registered in Atsugi-shi, Kanagawa, Japan. April 1, 2002 Following the transfer of the taste sensor business from Anritsu Corporation, INSENT launches itself as a business focusing on the development of taste sensors and the provision of related services. July 16, 2002 INSENT's capital reaches 52.5 million yen. October 26, 2002 INSENT's capital reaches 55 million yen. November 19, 2002 INSENT receives an award at the Kanagawa Business Audition. October 2003 INSENT receives support as part of a Venture Supportware project from the Venture Enterprise Center. December 30, 2003 INSENT's capital reaches 91 million yen. April 2004 INSENT is recognized as an Innovative Small and Medium Enterprise by Kanagawa Prefectural Government. September 2004 INSENT Corporation establishes a new company, Taste & Aroma Strategic Research Institute Co. Ltd., providing marketing, consulting and content-based services based on the digitalized taste measurement of foodstuffs to provide clear and straightforward taste information to customers. November 2005 INSENT receives an incentive award from Kanagawa Prefectural Government at the 22nd Kanagawa High-Tech Grandprix. INSENT's capital reaches 95 million yen. April 2007 Under the financial support program “Risk-taking Funds for Technology Development,” Japan Science and Technology Agency recognizes the successful development of the TS-5000Z taste sensing system. July 2007 INSENT starts selling the TS-5000Z Taste Sensing System (Japanese language version) to the Japanese market. February 2008 INSENT is recognized by Kanagawa Prefectural Government as a "Kanagawa Standard" for its high-tech taste sensing technology and business plan. March 2008 Together with Prof. Toko, INSENT receives an award from the Resona Foundation for Small and Medium Enterprise Promotion at the 20th Awards for New Technology and New Products of Small and Medium Enterprises. February 2009 The successful development of the sweetness sensor by INSENT is recognized by Mitsubishi-UFJ Technology Development Foundation of Japan, who provided financial support. March 2009 INSENT receives 4 awards from the Institute of Industrial Promotion, Kawasaki, at the 58th Kawasaki Entrepreneur Audition Business and Idea Seed Market. April 2009 INSENT is selected as one of 300 small and medium enterprises that are supporting innovation in Japan by the Small and Medium Enterprise Agency of Japan. June 2009 INSENT launches the TS-5000Z Taste Sensing System (English language version) for the global market. July 2009 Together with Prof. Toko, INSENT receives the 34th Inoue Harushige Award from Japan Science and Technology Agency. July 2009 INSENT receives the 3rd Monodzukuri Nippon Grand Award Special Prize from the Ministry of Economy, Trade and Industry of Japan. December 2010 INSENT's capital reaches 125 million yen. April 2011 Prof. Toko and INSENT receive a technical award from the Iijima Memorial Foundation for the Promotion of Food Science and Technology.